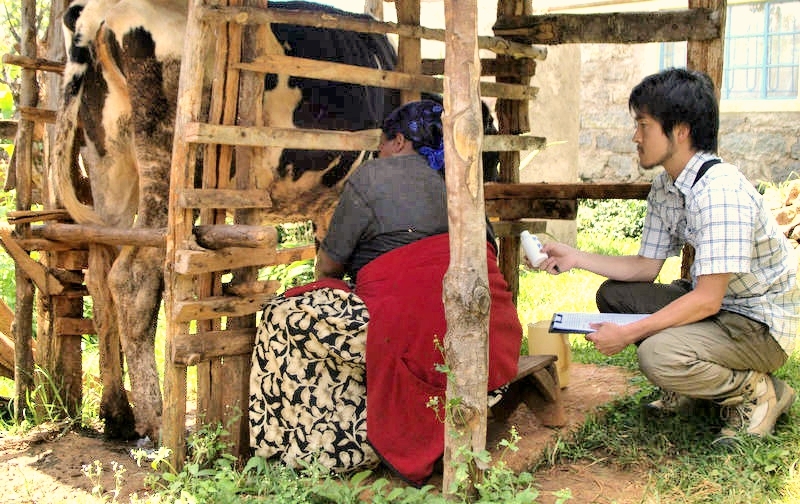 ILRI graduate fellow Taishi Kayano, from Rakuno Gakuen University, collects milk samples from a Kenya dairy farmer as part of a scoping survey of aflatoxins in the feed-dairy chain in Kenya (photo credit: ILRI/Taishi Kayano). A new paper describes and assesses the strength of a theory of change for how adoption of farm-level technologies and practices for aflatoxin mitigation can help reduce aflatoxin exposure among consumers. ‘Aflatoxins, naturally occurring fungal toxins that contaminate maize and groundnuts and other crops, pose both acute and chronic risks to human health. Aflatoxins are odourless and colourless and impossible to detect accurately without appropriate testing technologies. Both humans and animals are affected, and there is an additional risk of aflatoxin transmission through animal-source foods, especially milk, from animals fed contaminated feed. ‘Consumption of very high levels of aflatoxins can result in acute illness and death. Chronic exposure, which causes the greater human health burden, is a problem in low-income populations in the tropics that consume relatively large quantities of staple crops prone to aflatoxin contamination. The best-documented health impact of chronic exposure to aflatoxins is liver cancer; up to 172,000 cases per year are attributable to aflatoxin exposure. Other health effects, such as immune suppression and child stunting, have also been associated with aflatoxin exposure. ‘While the health impacts of aflatoxin in humans have been widely studied, the correlations between dietary consumption, serum aflatoxin levels, and morbidity and mortality outcomes have not been clearly described or documented. More evidence on these relationships is needed in order to assess the disease burden from aflatoxin exposure relative to other public health problems, and to estimate the cost-effectiveness of alternative mitigation options in developing-country contexts. ‘In addition to the health consequences, the presence of aflatoxins can reduce agricultural productivity and limit the growth of commercial markets and trade. In developed countries, strict standards are enforced to minimize aflatoxins on crops consumed by humans or animals. These standards have implications for market access and exports from Africa and other regions where aflatoxin contamination is common and where standards are not currently in place or enforced. Where aflatoxins are widespread and the costs of mitigation and testing are high, meeting standards remains challenging. Quality differentiation based on either market rewards or public standards is still unusual in most developing countries. Innovative approaches that combine technological and institutional change with increased education and consumer awareness are likely to be required to address this challenge in the near term. Within agriculture, research has focused on developing farm-level technologies and practices that mitigate aflatoxins at their source, in farmers’ fields. ‘Pre- and post-harvest technologies have been shown to be effective in terms of inhibiting aflatoxin contamination, in many cases to within international standards. Application of proven and existing “good agricultural practices” in production and post-harvest (for example, drying and storage) can also reduce aflatoxin contamination. However, studies have found that knowledge and awareness about aflatoxins is generally low, as is use of risk-reducing practices, among smallholder farmers and other stakeholders, particularly along the maize, groundnut, and milk value chains. ‘More work is needed on developing, adapting, and promoting risk-mitigating technologies and strategies and on understanding the incentives for and barriers to their widespread adoption. Because of the complex, multifaceted nature of the aflatoxin challenge, it is important to look at specific solutions such as agricultural technologies in the broader context of how they are expected to contribute not just to reducing on-farm aflatoxin contamination but also to achievement of the ultimate goals of food and nutrition security, economic development, and public health. To date, little attention has been paid to how adoption of these technologies would influence health outcomes. A win-win situation is often assumed; however, the link between agricultural technology adoption and public health outcomes is complex, especially where markets are important for producers and consumers, and the risk of unintended negative consequences may be significant. Read the whole theory of change analysis—IFPRI Discussion Paper 01452, July 2015: The potential of farm-level technologies and practices to contribute to reducing consumer exposure to aflatoxins: A theory of change analysis, by Nancy Johnson, of the CGIAR Research Program on Agriculture for Nutrition and Health (A4NH) at the International Food Policy Research Institute (IFPRI); Christine Atherstone, ILRI consultant; and Delia Grace, leader of the agriculture-associated diseases flagship of A4NH and of ILRI’s Food Safety and Zoonosis program. Tags: aflatoxins, Delia Grace, groundnuts, IFPRI, MAIZECRP, TOC. Bookmark the permalink. Aflatoxins and aflatoxins contamination is a serious problem in Ghana especially northern Ghana where large quantities of groundnuts, maize and fresh milk are consumed by the rural-poor.